Kiple, Kenneth F. and Conee Ornelas, ed (2000). Cambridge World History of Food. 2 vol.. ISBN 0-521-40216-6. ソフィー・D・コウ. (1994). America's first cuisines. ISBN 0-292-71159-X. Ortiz de Montellano, Bernard R. (1990). 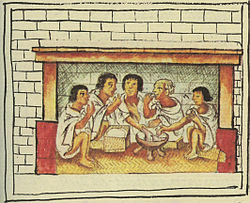 Aztec medicine, health, and nutrition. ISBN 0-8135-1562-9.